How is the KSM Trial Like a Garbage Barge? Remember the Mobro 4000? 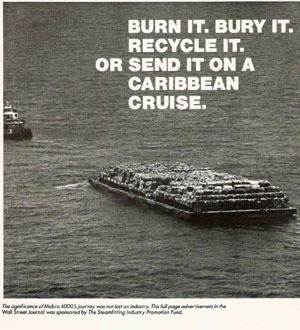 I didn’t recall it by that name, but I certainly remember the garbage barge that in 1987 traveled up and down the Atlantic seaboard, from Long Island to Belize and back, looking for a place to unload 3,100 tons of garbage. After the initial rejection, no state or country on the East Coast would let the barge unload. I don’t recall ever hearing that there was anything particularly toxic about the contents, but the barge had become so notorious that nobody wanted to take any chances. Eventually the garbage went back to Long Island for disposal there. This came to mind when I heard that New York City officials had come to their senses and begun lobbying the federal government to abandon plans to try 9/11 mastermind Khalid Sheikh Mohammed and others in civilian court in lower Manhattan. Certain adjectives seem to connect with certain blog topics in my mind, and I find that I’ve referred to this as an “indefensible decision” not once, not twice, but three times. A grandstanding mayor in upstate New York promptly suggested holding the trial at the air force base in Newburgh. (Other local officials fell all over each other denouncing the idea.) I can’t find a link, but I heard on the radio that some other politician said it should be held in Obama’s home town of Chicago. I envision the planned KSM trial now traipsing from one venue to another, turned away at every stop. It would be poetic justice if KSM and his fellow terrorists, like the wandering garbage barge, end up right back where they started — in this case, Guantanamo. The Gitmo option is still available, now that the president has abandoned his self-imposed deadline to close the facility in his first year. This entry was posted in Uncategorized and tagged Guantanamo, KSM by Kirk Petersen. Bookmark the permalink.